Writer; lived at Cracow; son of Solomon Calahorra (No. 3). He was not a physician, as Fürst and others have it, nor did he come from "Califoora." In 1624 he completed "Yismaḥ Yisrael" (Israel Shall Rejoice), a lexicon to the four ritual codes in alphabetic order. It was published at Cracow in 1626 and again at Amsterdam in 1693, together with the commentary "Ḥuḳḳe Da'at" by Moses Jekuthiel Kaufman. Single parts of it appeared at Berlin in 1700 and at Dyhernfurth in 1701. The code Yoreh De'ah was published at Vienna in 1865, together with the commentary "Ḥuḳḳe Da'at " and a commentary, "'Olelot Ẓebi," by M. H. Friedländer. 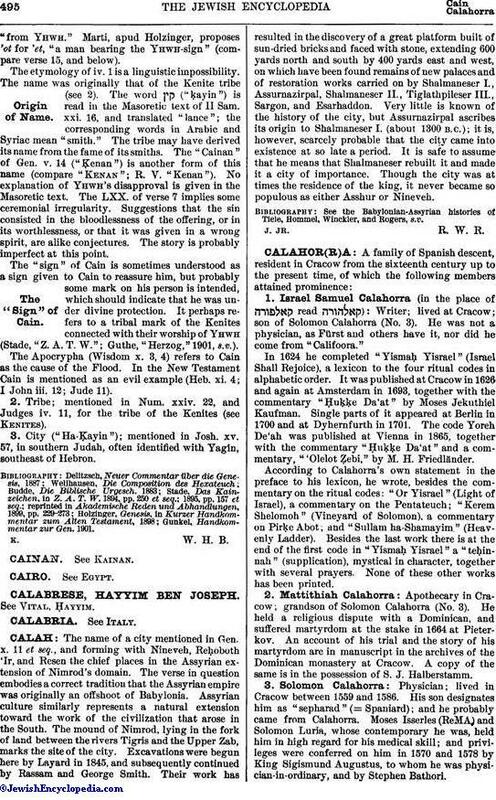 According to Calahorra's own statement in the preface to his lexicon, he wrote, besides the commentary on the ritual codes: "Or Yisrael" (Light of Israel), a commentary on the Pentateuch; "Kerem Shelomoh" (Vineyard of Solomon), a commentary on Pirḳe Abot; and "Sullam ha-Shamayim" (Heavenly Ladder). Besides the last work there is at the end of the first code in "Yismaḥ Yisrael" a "teḥinnah" (supplication), mystical in character, together with several prayers. None of these other works has been printed. Apothecary in Cracow; grandson of Solomon Calahorra (No. 3). He held a religious dispute with a Dominican, and suffered martyrdom at the stake in 1664 at Pieterkov. An account of his trial and the story of his martyrdom are in manuscript in the archives of the Dominican monastery at Cracow. A copy of the same is in the possession of S. J. Halberstamm. Physician; lived in Cracow between 1559 and 1586. His son designates him as "sepharad" (= Spaniard); and he probably came from Calahorra. Moses Isserles (ReMA) and Solomon Luria, whose contemporary he was, held him in high regard for his medical skill; and privileges were conferred on him in 1570 and 1578 by King Sigismund Augustus, to whom he was physician-in-ordinary, and by Stephen Bathori. 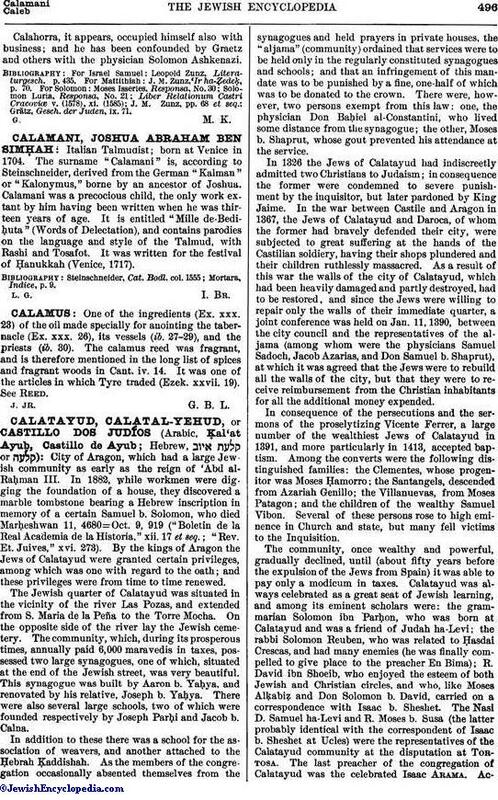 Calahorra, it appears, occupied himself also with business; and he has been confounded by Graetz and others with the physician Solomon Ashkenazi. For Israel Samuel: Leopold Zunz, Literaturgesch. p. 435. For Mattithiah: J. M. Zunz, 'Ir ha-Ẓedeḳ;, p. 70. Grätz, Gesch. der Juden, ix. 71.